Update - Mars is no longer open. Let me start by telling you how I met Elena. I got an email from a former Italian coworker of mine asking me to show a new to Austin Italian professor around last fall. The former coworker, Walter, is an easy going fun guy in his fifties, so naturally I assumed that this Italian professor would be around his age. I was preparing in my mind for activities to take such a person to. It was late October and the whole 6th street on Halloween debacle seemed entirely inappropriate, so I searched my brain and decided that a simple brunch was a good introductory session. This would allow us to size each other up and figure out if a relationship was going to beneficial for friendship, but more likely networking or general about-town knowledge. The shock came when Elena showed up at my house as a drop dead gorgeous extremely friendly and fashionable grad student of 28. Not at all the powersuited serious 50 something professor I was expecting. I guess something was lost in translation between Walter and me. The other thing that was lost in translation was that Walter had never actually met Elena. Flash forward to April. Walter’s time in the US is complete and sadly for us, he is about to go back to Italy. He wants to take a drive down to Austin from DFW to meet and greet his fellow Milano over lunch, and I’m in charge of making arrangements. It’s a beautiful Texas spring day, the sun is shining and the only requirement I can think of is that I do not want to be stuck indoors. I discuss a few options with Elena and decide on Mars on South Congress. The environment is right and the patio is great. I’ve been there once before and found the food not quite worth all the hype, but decent and I believe it will do for the purpose. Unfortunately, when Walter shows, we give him the options of Italian, American or Asian and he quickly vetoes Italian and Asian. We convince him to try Mars anyway, marketing it as Asian infused American cuisine, and that if he doesn’t like the menu, we can venture down to South Congress Café. When we arrive, South Congress Café has an hour long wait, so he reluctantly concedes to Mars. I’m feeling a little guilty at this point, after all the guy did drive 3 hours just to have lunch with us and I’m forcing him to eat a cuisine he despises, but I quickly shrug off the nagging guilt feeling when I spot several items on the limited, but adequate lunch menu that I think will do for even the most staunch Asian food hater. Walter requests that we eat inside and part of me dies right then and there. I console myself with the reassurance that I have the rest of the afternoon to enjoy the sun. As we are seated, Lach (my boyfriend for all of you new readers) begins to look around and make running commentary on the décor. He says he’s not sure if he’s in a restaurant, a nightclub or a fetish shop. I see where he’s coming from. The black and red interior comes off as quite gothic, the kind of décor I expected and failed to see at Prague. They are trotting a fine line between stylish and overdone, but somehow seem to pull it off. Perhaps it’s the location, type of cuisine, absence of gargoyles and other cheesy relics, or the accommodating demeanor of the staff that day that seals the deal. It’s hard to pinpoint exactly why it works, but it works. We order a bottle of white wine and hummus/baba ganough to start. The starter comes with grilled flat bread with bits of red pepper infused. It’s just the slightest bit spicy and goes well with the hummus. The baba ganough, on the other hand, is something I could have done without. It tastes to me a bit slimy. Perhaps from too much oil or maybe overcooked eggplant? We munch as we pick out our courses and request more bread. I choose the Mizuna and Tatsoi Salad with pickled onions, crispy wontons and creamy sesame garlic dressing. Elena decides on Salmon with soy wasabi aioli, sticky rice and vegetable du jor. Walter avoids too much Asian with Wagyu Steak and Frites, and Lach picks the Marinated Tenderloin Salad with croutons, Thai Basil, mint and kim chee vinaigrette. Our food arrives within a decent amount of time and the portion sizes are not oversized. My salad is fresh and green and the onions are slightly sweet and not overpowering. The crispy wontons remind me of being a kid and overindulging on foods that are terrible for me, like the wontons provided by cheap and greasy Chinese restaurants. It’s a secret shameful pleasure executed in a non greasy way that accentuates the rest of the salad instead of taking it over. I’m not sure if I would describe the dressing as creamy, but the leaves were lightly tossed in something that was very tasty. Elena’s salmon looked really nice. I watched her carefully pull the skin off the top before diving in. The sticky rice looked unpalatable to me, but the asparagus accompanying the plate looked delicious. Walter had this same asparagus on his plate as well. The style it was cooked in was the only Asian influences his plate contained. The steak seemed nice, and he did not complain. The frites were curly bits of fried potato that looked mildly unappealing and mostly remained on his plate. Lach enjoyed his salad, but was surprised to find that the tenderloin was presented in skewered chunks as opposed to thinly sliced pieces. He admitted to me that he enjoyed Mars more than he had enjoyed his past experience at South Congress Café. We were all satiated. Walter (being the typical coffee-snob Italian) did not trust the espresso at Mars and suggested we travel to Starbucks to finish our afternoon. I cringed and proposed Mozart’s instead. Not only did I want to avoid the ever-present Starbucks, I could finally get some time outdoors on a nice patio. He agreed to try it and was actually quite surprised. Although he and Elena recoiled at disgust at the ice cream/gelato, he and Lach gave the espresso two thumbs up. 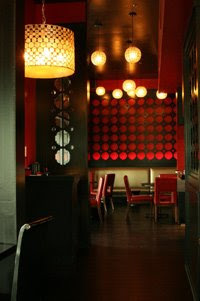 Overall: Asian influenced American food in trendy dark atmosphere. Although overrated amongst most Austin hipsters, it does pull off a good meal and has a fabulous patio perfectly situated on trendy South Congress.